Broccoli in salads is my favorite. I especially love this Broccoli Cashew Salad that is on the blog. 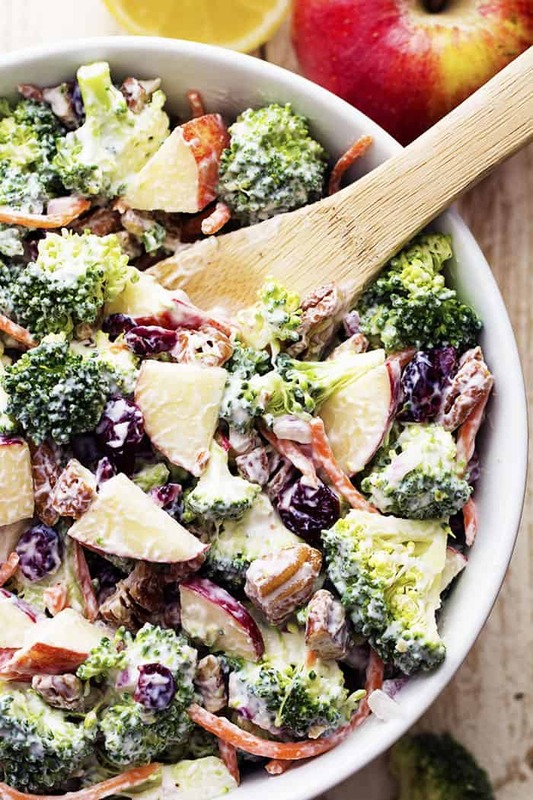 But this Broccoli Apple Salad became an instant favorite! As I was eating it, I just couldn’t get enough! I knew this salad would be amazing but I wasn’t expecting it to become a new favorite! SO many delicious new textures and flavors in this salad. 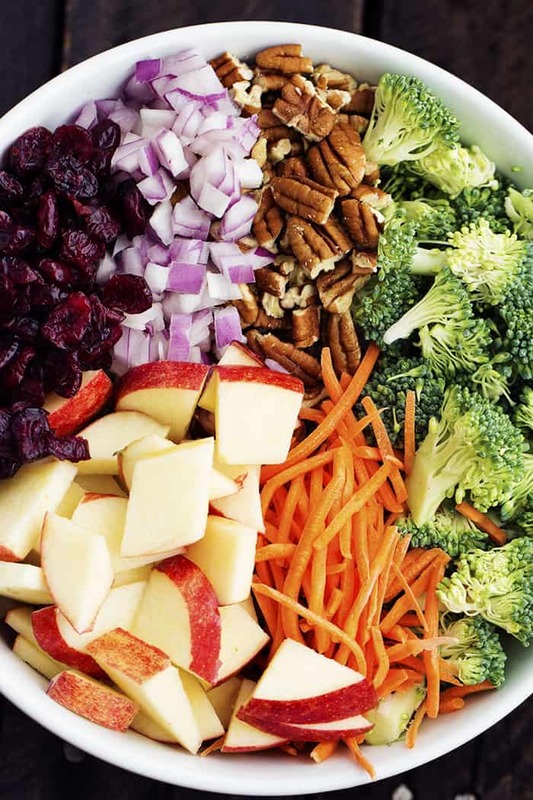 The broccoli, carrots, and red onion, was followed by the sweetness of the apples and dried cranberries. The pecans added another yummy flavor and crunch. The creamy dressing on top was THEE best. Holy cow. It completed this fresh and delicious salad perfectly. I know that if you make this salad, it will become an instant favorite as well! Broccoli is my favorite veggie by far, but I always just end up steaming it or simply roasting it, I need to get more creative. This looks so delicious and refreshing, the perfect way to switch things up a bit! This is an awesome salad. Sometimes I put tiny little pineapple tidbits in it also! I took it to a Bible study meeting and everyone loved it and ate every morsel. Oh this looks so yummy! I love broccoli too! It pretty much goes with anything. We always have it around too! I am so going to try this salad, it looks amazing. thanks. I have made the Broccoli Cashew Salad for years. I can’t wait to try this broccoli salad!! I’m sure it will be my new favorite salad too!! I have a family reunion coming up in March and this will definitely be included in what I take! Halved grapes both red and green are great in this also. I just finished making this about 2 minutes ago. I am not a fan of raw broccoli but my husband loves it. I saw this recipe and thought it sounded refreshing. I am so glad I decided to give it a go! It is delicious! The lemon to sweet ration is on point and I love the added pecans. Perfect addition to our Super Bowl festivities! The only change I made was no onions. I am so glad you liked it!! I am not crazy about raw broccoli either but this salad is seriously amazing!! Will the broccoli get soft at all, my family is not a fan of raw broccoli either? Maybe you could LIGHTLY steam the broccoli so it’s still crispy but not totally raw, Tammy? (But I wouldn’t cook it completely because it will change the texture and flavor too much, I would think.) Just a thought. Looks delicious! Would you post the nutritional info for this please? Use Splenda Baking Blend instead of pure sugar. I do and it makes a major difference in calories and tastes good. Thank you so much. We have a Type II and need to know the carb count. Fibre helps too. Looks like about a cupful is 2 carbs (15g x 2). 6 -7 are allowed for supper so all’s good. Do the apples get brown in the leftovers? The apples do not get brown because you have lemon juice on them. I’m eating some now that was made 48+ hours ago, still deliciously crispy! I definitely will try this one!! Sounds refreshing!! I just made it for dinner with bacon bits as well! !.and n.ow carrots and apples and pecans…sounds great!!! Do you have the Nutritional info on this Great sounding Salad? What a refreshing change from my normal broccoli salad. Thank you so much for sharing. Will be a normal salad for us now. Made this for dinner tonight! Everyone loved it. I would probably up the dressing a little. Made this tonight and loved it! I added chickpeas to make it a meal, and swapped out the mayo for 1 avocado mashed to lighten it even more. Then while I was eating it, I was struck with the inspiration that it would be even more amazing with strawberries, so I diced a couple up per serving and tossed them in, and I have to say, they really put this salad over the top! We’ll definitely be making this again! Thanks! We love Broccoli Salad and have made it for years. I am anxious to try your version – It looks yummy!! Is there something that you can recommend in place of mayo? Use a yogurt….plain or honey or vanilla even. Made it, it was really good. How can I find out the calories? I made this for the super bowl, I ate the whole thing myself, wish that I would have left the onions out. This salad is just amazing – made it yesterday, there is just enough left to go with dinner tonight. Just could not stop eating it – just awesome! Made this tonight. Everyone loved it including my Father-in-law. Will definitely make again. Sounds deliscious! Do We have nutrition facts on this salad? Thanks!! My eye consultant at Q A Hospital Portsmouth, looked into my eyes. Final comment ” You should eat more Broccolli ” O.M.G. Looked at your recipe and will definitly try it. Thanks. Made this last night….didn’t have the yogurt so was a little ‘richer’ with just mayo – didn’t have lemon but did have key lime – absolutely delicious – the crunch and sweet and tang….perfecto. Will be making this often! I made this salad today and we loved it, will definitely make this again. The only thing that I might change is to add just a bit more dressing. I would also like the nutritional info on this salad if it is available. I found your recipe over on Pinterest and had to link to it on my healthy recipes roundup this weekend. I can’t wait to give it a try. I love broccoli to pieces, but never had it raw. Your salad looked so appealing, I just made it right away and enjoyed every bit of it! I will definitely make this for a summer lunch at work, perfect to prepare a day in advance 🙂 Thanks! I had no nuts, substituted raisins for cranberries, and completely forgot to add the carrots! This tasted just so good, different, refreshing. I always try cutting back on dressings and oils in my recipes, trying to save a few calories. Not for this recipe though, as I found out. The dressing amount is just right enough for the salad and not collect at the bottom of the bowl. Making some today! Looks delicious! However, I am dairy intolerant any ideas for a non-dairy dressing that would work with these flavors? Can you suggest a way to make this a bit more diabetic friendly? Wondering if you got an answer? Wondering if you got an answer about making it more diabetic friendly? Spenda Baking Blend is highly recommended. Has anyone substituted something (or left out) the greek yogurt? I don’t like yogurt AT ALL. I know, I know… Other than that, this sounds delicious! You can use all mayonnaise but I promise you won’t even know! The creamy dressing on top is delicious! I made this just as it’s written and you would never know there is yogurt in it. My husband and I both agree this is one of the best salads we have ever eaten. It has become a family favorite. Thank you so much for the recipe. No the lemon juice keeps them nice. Mine lasted 3 days in the fridge but I made a huge bowl full. I subbed sour cream in the same amount as the yogurt and it was delish. I was very excited to try this salad. Even better than I imagined. Couldn’t get enough. Looking forward to trying some of your other recipes. How far ahead can you make this salad? Also would the apples brown if made ahead? Looks wonderful and I plan to make it for Easter dinner! I would probably make it the day of. Although I have heard of people making it the night before and refrigerating it as well. My family aging from 4yrs up to 76yrs. Loved this salad.thank you for the amazing recipe. I’m not one to comment typically but I have to say this was AMAZING!!! And, honestly, i think even better the next day for leftovers. 🙂 Thanks so much!! I made this for my Bunco group. It makes a full salad bowl ,healthy, tasty, and eye appealing. I will be making this for my next family gathering. I followed the recipe without making any changes and it tastes delicious. I bet you could substitute kale for the broccoli and it would be yummy as well! YES!! I need to try that!! For those who are diabetic, would it hurt to leave the sugar out of the dressing since the fruit adds sugar? I would sub fresh grapes or strawberries for the dried cranberries so those would add sugar as well. 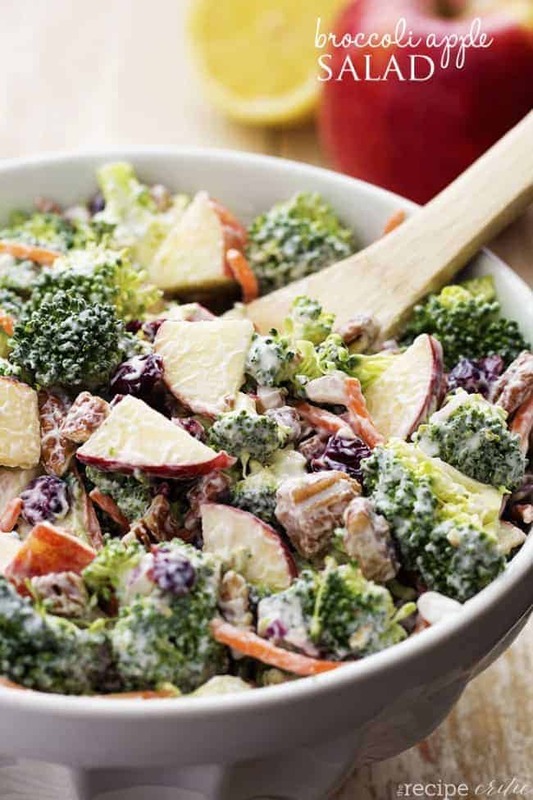 This sounds so delicious – much better than a Waldorf salad! Would give it five stars if not for so much sugar. Finally a broccoli salad without bacon! Husband is vegetarian and he loved it!! I took this to my dad’s house for dinner, and everyone LOVED it!!! It’s creamy with a bit of sweetness that’s balanced by the lemon juice. The broccoli and apple go together so well. My go to recipe when I need to bring a dish! Is it possible to have a sugar substitute that is natural rather than refined? Any suggestions would be appreciated. I made this today and it was GREAT!!! Meat or fish is great with this salad for me.? I love this salade, however I would like an replacement for the lemon juice as to i am allergic to citrus ! Verjiuce perhaps. or whote wine vinegar? I made this a few days ago. I don’t like yogurt and didn’t like it right away. But after chilling overnight? OMG I couldn’t get enough of it!! I couldn’t taste the yogurt and all of the flavors just melded beautifully. Will try with pineapple and maybe grapes next time. Thanks for posting!